6000+ Satisfied Guests. 16+ Years. Led by Maestro Alberto Torres Davila. 45+ years and 5,000+ Ayahuasca Ceremonies. What can Ayahausca do for you? What can you expect? Experience your authentic Ayahuasca ceremonies in a safe and world-class professional environment. Maestro Don Alberto Torres Davila has over 50 years of ayahuasca experience and Blue Morpho has been in operation for more than 16+ years with over 6,000 satisfied guests. * How much should you drink? * How do you set intention? * How do you navigate the experience? * What can ayahuasca do for you? * What can you expect? * How to go deeper, safer, more powerfully. 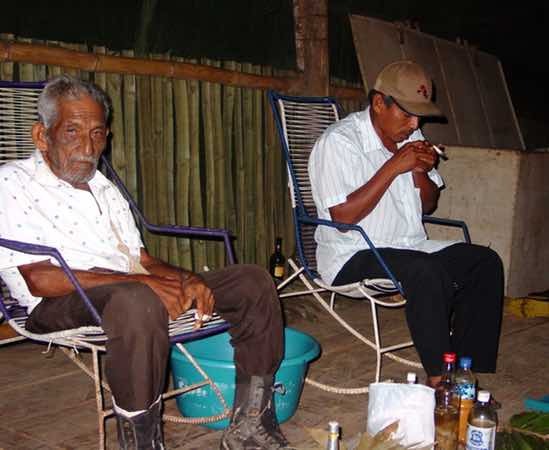 Led by 7th generation Master Shaman Don Alberto Torres Davila, who has over 50 years of experience working with medicinal plants and is recognized as one of the best Ayahuasca shamans in the Ucayali River region. Ayahuasca ceremonies help you to deeply release, purify, learn and evolve. You will experience the mysterious and transformational power of Ayahuasca with the help of Blue Morpho’s highly trained team of shamans and support staff. You are supported through each ceremony by our Master Shamans and highly trained Shamanic Support Staff. There are at least 2 shamans and 6 support staff in every ceremony, who take care of your every need. Teach you how a ceremony works and what to expect. Discuss what ayahuasca is, how it works with you, and what you may experience. Outline Blue Morpho jungle lodge safety and procedures. You get to participate in all aspects of Ayahuasca preparation so you can learn the traditional process from raw plants to final brew. We show you every medicinal plant that goes into each fresh batch, cooked on-site with every group. You will get to experience an open discussion about the different medicinal plants and their properties. This resource illustrates the camp’s facilities and processes so you can make the most of your stay. It is a valuable resource to bring home for reference and continued learning as well. Group support discussions are held during the day after Ayahuasca ceremonies. This is an open, non-judgemental and communal space to share your experiences and ask questions. The shamans and assistants can help you understand, process and integrate your Ayahuasca experiences. You receive practical guidance throughout group discussions and in ceremony, helping you make meaningful progress. Ask anything you need in question-and-answer sessions about traditional Ayahuasca shamanism. This helps you to work in understandable, insightful and useful ways, during and beyond ceremony. If you need it, space is available for you for private one-on-one time with the shamans and assistants. Daily activities bring a cohesive, interactive and positive group dynamic that complements and deepens your work with Ayahuasca. To help you fully benefit from your experience and incorporate your ayahuasca experiences into your daily life, we emphasize the importance of integration from the first day. Guidance in traditional plant dieta methods and your dieta. Four medicinal tree bark dieta preparations. Medicinal plant identification and discussions. Participation in the ayahuasca cooking process. Yoga and/or breath work sessions. Integration skills and practices… and more! Daily room service and linen changes throughout your stay. Clean towels are supplied to you. They are changed regularly, and fresh towels are available upon request. Complimentary laundry service so your clothes are cleaned, dried, folded, and returned to your room at no extra cost. Electricity and Wifi in our main house common area. Enjoy a large assortment of reading material on shamanism and spirituality, fiction, travel and many other types of books. Board games like chess and checkers, cards, plus drawing and art materials are available in the main house. A sugar-free Juice bar during the day serving local juices that are safe to consume as part of your ayahuasca experience. Professional massage service (for an extra fee) by a local renowned huesera (bone setter and body-worker). You will enjoy exceptional food prepared fresh on site by government-certified staff in our licensed professional kitchen. Most people are pleasantly surprised by the quality, flavor and variety of our menu. All food served at our lodge always adheres to the requirements for your safe Ayahuasca diet: no sugar, alcohol, red meat or pork products. Clean, filtered water is used in all your cooking and food preparation. High-quality filtered drinking water is available for you 24/7 in all bungalows and common areas. A variety of refreshments and hot beverages are available for you: fresh local juices, herbal and black teas, coffee and coffee substitutes, soy and skim milk. Your personal nutrition requirements can be accommodated: vegetarian, vegan, pescatarian, paleo, ovo-lacto and gluten-free. You are centered on 180 acres of private jungle reserve, giving you an ideal location and intimate ambiance for your Ayahuasca experience. All your bungalows and common areas are fully mosquito proofed. Your private room has mosquito nets, high quality mattresses and bed sheets, battery-powered lanterns, and ample furniture for organizing your personal items. Our main house lounge offers you a comfortable common area with rocking chairs and tables, ornamental plants, library, a daily schedule board, jungle trail maps, Wi-Fi and electricity. Modern bathrooms with full-flush toilets in your bungalow as well as multiple private toilets in the ceremonial house and other common areas. There is an abundance of clean bathrooms available for you. Fully-tiled, hot water showers in your bungalow, as well as two showers in the ceremonial house and another at the massage studio. Cool off and relax at our large deck and pool area and enjoy the jungle beauty in comfort. The ceremony house doubles as a hammock lounge so you can relax during the day. During the day you can go on a network of hiking trails of various lengths around the property, with two private meditation bungalows. Smoking and non-smoking sections are provided in the ceremonial house as well as other common areas to give you maximum comfort. Rooms are zoned as quiet spaces 24 hours a day with camp-wide quiet hours each afternoon so you can sleep as much as you need. As part of the registration process, you will receive an extensive Journey Guide that covers getting to Iquitos, what to pack, local activities, restaurants, information on the jungle climate, ayahuasca, flights, and more. We’ve already figured out everything you need for you. You can download your Blue Morpho Journey Guide now to prepare you for your Blue Morpho sacred plant experience (available when you sign up for our newsletter at the bottom of this page). You will get a series of pre-retreat emails that guide you through the entire process from registration to preparation and detailed logistics for arrival. Admin services are available to answer any question you may have related to our retreat programs, services and process, prior to and during booking. You are protected through a professional online reservation system through which all questions and concerns can be addressed within 24 hours. Our easy payment system accepts all major credit, debit and chip cards. For your health and safety, our registration process includes medical screening and detailed questions about your intentions for coming to Blue Morpho. Not sure if this is right for you? Our website gives you an updated and continuously evolving body of content on what we offer, location information, media and previous guest experiences to help you make the most informed decision about working with us. You will receive a series of integration emails that provide guidance on the process of re-entering your life post-ayahuasca. You will be enrolled in our online Blue Morpho private community group. This helps you to maintain your connection and support with others who have been through similar Blue Morpho experiences. It will be invaluable to you having a like-minded community of friends on a similar journey after your life-transforming experiences. You can get post-retreat email support from our shamanic team if you need it. We have developed integration materials to help you maintain your connection with ayahuasca and spirit, build your daily practice, and continue your healing and learning. Included with your retreat is a Video Integration Package that includes 5 videos and an audio meditation designed to help you support and enhance integration when you return home. You can also download Blue Morpho icaros and Amazonian shamanism-inspired music created with top musicians around the world for free. A professional, studio-recorded CD of Maestro Alberto’s icaros is available for purchase here. What you get for your maximum safety and well-being. You will enjoy clean, well maintained, high-quality accommodations – Some of the best available in the Amazon! Our entire staff is handpicked and specially trained to handle the unique needs of your ayahuasca retreat. To fully support and guide you, we have specially trained staff who do not drink ayahuasca. They attend all ceremonies to provide you with aid and support. They can help you get blankets, get you drinking water, change your buckets, support you to the bathrooms, and whatever else you may need. Our shamans always maintain a professional relationship with you. Pre-screening for major health conditions assures a safe environment for you to consume ayahuasca. We provide you with a stable environment in which all alcohol and recreational drugs are banned (any guests who fail to comply with this restriction are asked to leave the retreat to maintain the safety and comfort of the other guests). Trained security guards monitor the camp 24 hours a day to maximize your safety. We follow a government-mandated fumigation schedule to greatly reduce your experience of itchy bug bites. You get your own individual steel lock box so you have a safe location to store your valuables. You will enjoy safe bathing with treated water in all showers and sinks. Professional local guides lead you through all group jungle hikes and off-site activities. We keep a fully stocked first-aid cabinet. Emergency vehicles remain on site at all times. There is phone reception and wifi for making outside contact when needed. Easy access to hospital care within 90 minutes. There is access to a local clinic and pharmacy at a nearby village within 10 minutes of our retreat center. Our office staff is on standby in Iquitos during retreats to provide you with extra assistance if necessary. Our lodge is fully equipped with fire-fighting equipment in every structure. In case of a fire emergency, Blue Morpho follows a government-certified fire-fighting plan, including a guest safety zone for you. Who are we and why should you consider booking with us? Leading podcasts Aubrey Marcus, The Astral Hustle, Third Eye Drops and more. and many more publications and news media. 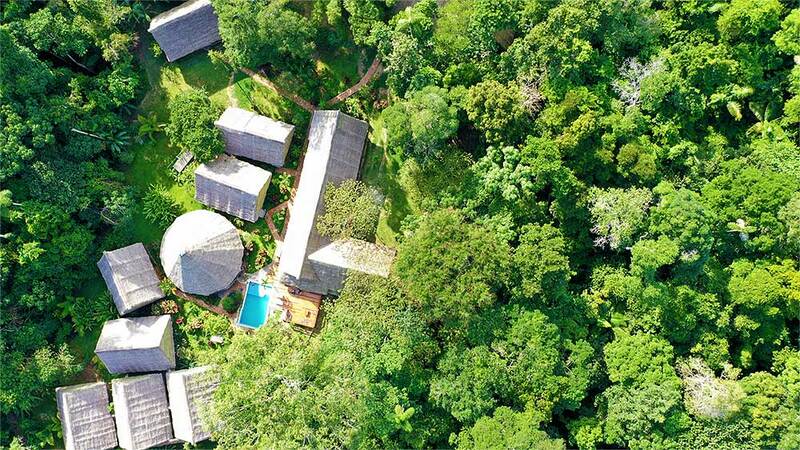 one of the world’s most well-renowned Ayahuasca retreats. It’s the most beautiful thing that has ever happened to me. I am so, so, so thankful to have my happiness back. This experience has been the most incredible gift. I am humbled, awestruck, and forever grateful. My 7th time and the best yet. The team of shamans, assistants and helpers were wonderful - warm, caring & helpful, bringing us to the peak and back to present. Love you all and look forward to seeing you soon. Incredible experience! Got a full confirmation of the spirituality of our universe! Thanks to the whole team of Blue Morpho for the amazing care and energy created for the transformation of human consciousness! What a wonderful, life changing experience. Thanks again for making me and my family feel welcome. Spent an amazing week with amazing people. It was truly a life-changing experience and everyone on the staff was so catering and helpful. Even though it can be a tough journey, they always kept the mood light. Amazing! I came to find myself and found so much more; love, life, God! Thank you Blue Morpho for helping me remember!